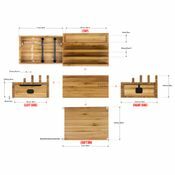 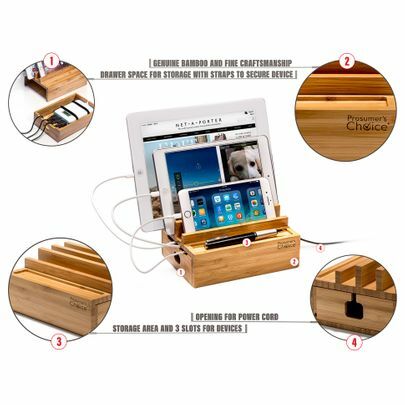 Organize Smartphones and Tablets: Made of all natural bamboo, an attractive multiple device holder that stores iPhones, iPads, iPad Mini, Nexus 7, Samsung Galaxy series, and other popular models while the devices are charging. 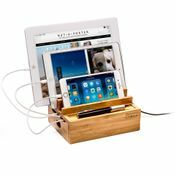 Charge and Store Up to Three Devices: Ideal for homes, offices, and especially perfect for nightstands, securely stores up to 3 Tablets or Smartphones and includes a pull-out storage space to hide and hold USB chargers or power strips. 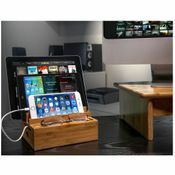 Keeps Cables Organzied: A multi-functional desktop organizer with a secure compartment for power hubs or USB charges, also includes a cut-out hole to run a power cord as well as a cable management slot to neatly run charging cables to your devices. 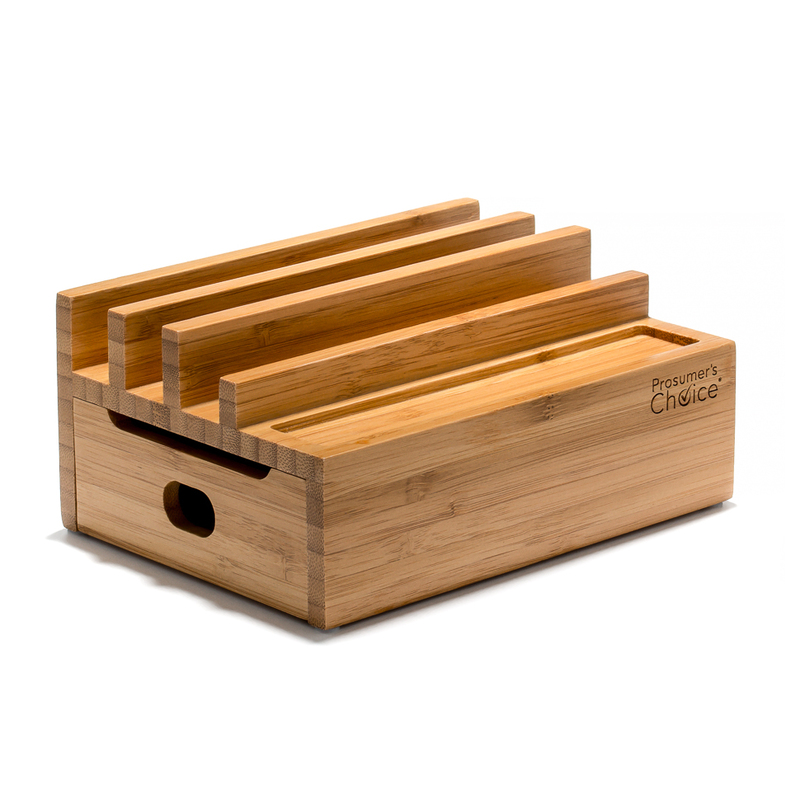 Made of Eco-friendly Bamboo: Constructed of 100% natural premium bamboo classified as a super renewable resource, the bamboo is biodegradable, recyclable, organic, moisture resistant, and easy to clean. 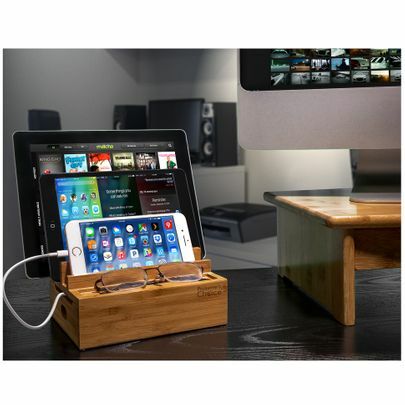 Anti-slip Base: Slip-resistant rubber legs keep USB Charging Station Dock steady while plugging and unplugging your iPhone, Samsung Galaxy, Google Nexus, HTC, Motorola Nexus, Samsung Galaxy, iPad Pro, and iPad Mini. Take charge of your gadgets with Prosumer’s Choice 3-Rack Charging Station Dock/Organizer for Tablets and Smartphones; a stylish and practical solution for keeping multiple devices neatly stacked, charged, and organized. Perfect for homes, offices, RVs, and dorms, the dock station holds up to 3 devices and includes a pullout storage base to pair the station with power strips and USB chargers. 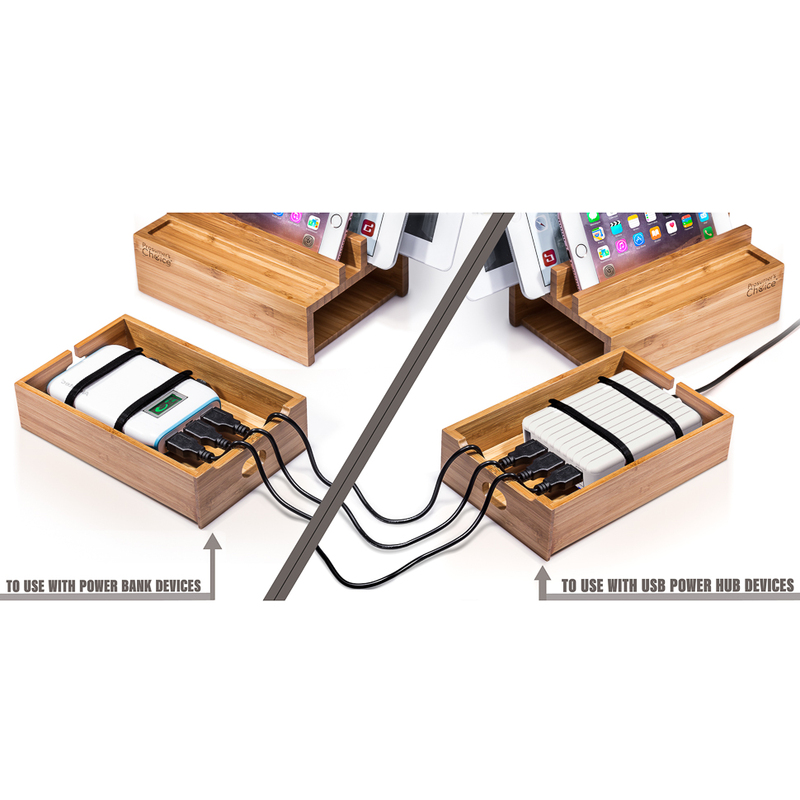 The base also features a cut-out hole to run a power cord as well as a cable management slot to neatly run charging cables to your devices. Imagine no more hide and seek with your chargers and cords! Get ready for a clutter-free desk or countertop. 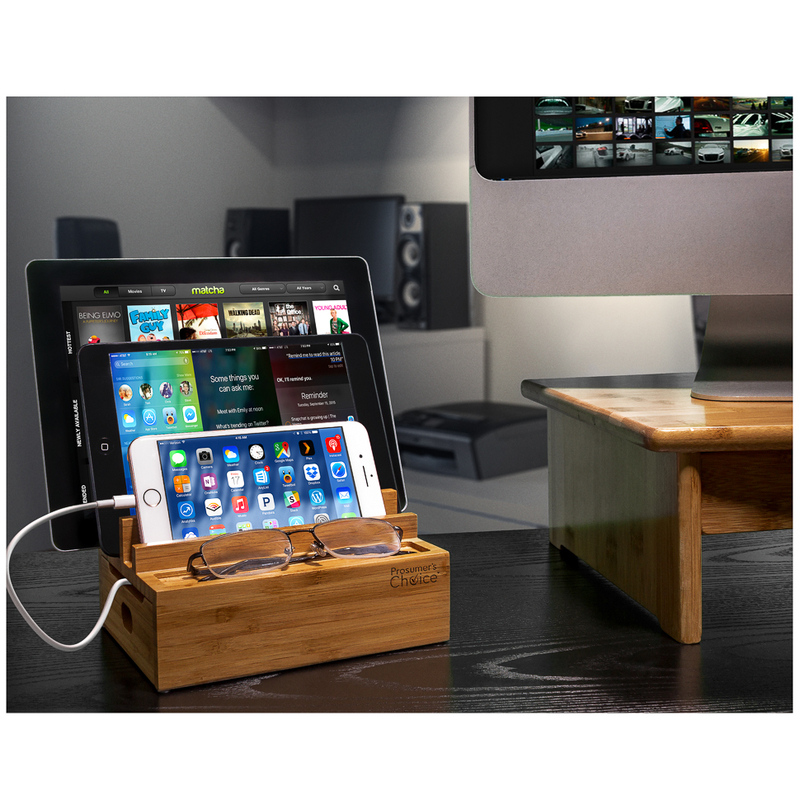 Made of naturally sturdy bamboo, which is classified as a super renewable resource, this versatile USB charging station dock blends easily with any décor and the compact design fits snugly on desktops, countertops, and night stands. Designed to accommodate most smartphones with enough space for cases, the bamboo stand also includes slip-resistant rubber feet that keep the stand secure and in place while you plug in and unplug your devices. An eco-friendly, problem-solving accessory that reduces electronic clutter, Prosumer’s Choice 3-Rack Charging Station Dock/Organizer helps keep Tablets and Smartphones, and the cords that go with them, charged in one beautifully organized place.